There are growing indications that the timber industry is on the verge of collapse, especially in the Brong Ahafo Region. The Brong Ahafo (B.A.) Regional Chairman of the NDC, Alhaji Collins Dauda, who sounded this note of caution, also revealed that the reconstruction levy and the new bidding system being implemented by the Forestry Commission (FC) are some of the factors leading to the near collapse of the country's largest employer. Alhaji Collins Dauda expressed these worrying sentiments on Peace FM's “Kokrokoo” Morning Show on Tuesday 18th May 2004. Whilst admitting that competitive bidding is good, the NDC, B.A. Regional Chairman was rather bitter about the amount being quoted by the FC as the new bidding fee. 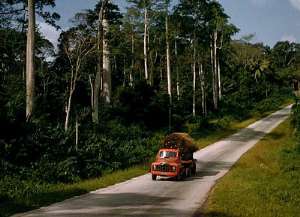 Under the new bidding system, timber firms are to pay between ¢900million and ¢26 billion each before the FC will release 100 compartments of teak concessions to them. However, when Peace FM called up the Minister of Lands and Forestry, Prof. Kwaku Dominic Fobih, he debunked that assertion. Speaking on the same platform (“Kokrokoo” Morning Show), Prof Fobih questioned why the industry in the Ashanti and Western Regions is thriving, whilst that of the B.A. Region should be in any imminent danger.